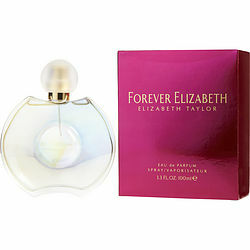 Forever Elizabeth by Elizabeth Taylor is a stunning fragrance for women that will turn heads and get you attention wherever you go. Fresh dewberry mixes with amber, jasmine, creamy amber and musk to create a scent that is both feminine and soft. Introduced in 2002, this casual fragrance is perfect for wearing when you are going about your daily activities. Splash it on before a trip to the grocery store or an informal afternoon at home and enjoy the touch of sweetness. Forever Elizabeth is so lovely. It's my first time using it and I'm very happy to say that I am enjoying it to the max. I grew really tired of White Diamonds over the years so I needed to try something else from her fragrance line. I'm kinda looking at the other White Diamonds versions,perhaps I'll try those very soon. Wonderful,and Happy Holidays everyone!! Love this perfume. Have used it for very long. I love Forever. It's the only perfume I will wear. This perfume last all day and I get nothing but compliment every where i go. I have been wearing since 2004 and I never get tired of all the attention.